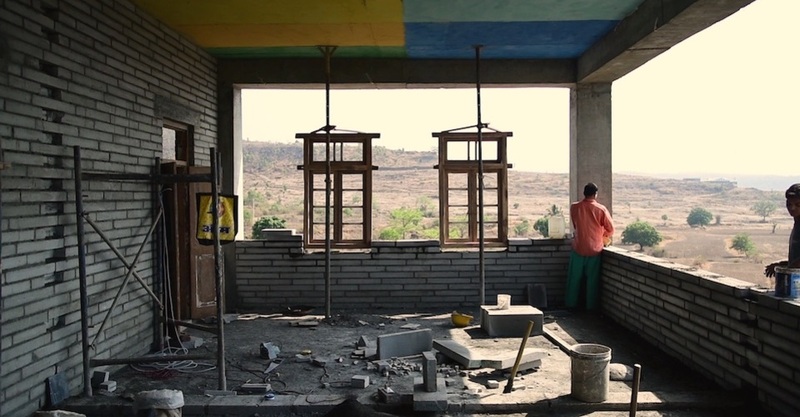 Presented at the 16th Venice Architecture Biennale, "A school in the making" is a film that present the process behind the construction of the Avasara Academy by Case Design Architecture Studio. Meant to be a residential school for young women in western India ("our aspiration is to try to prove the idea that if you have girls in front of really strong teachers and being pushed to think about how they can change the world, you will be able to produce leaders") and located into the valley slope above the small village of Lavale, the building that will host the Avasara Academy is not completed yet. However, its work-in-process condition actually goes much further than the usual. "A school in the making" is not just the description of a construction site, it is the most intimate expression of a design approach, a partecipative and open one, that sees Case Design at the centre of a galaxy of local craftmen, artisans, European visual artists and New York City based climate engineers. "We initially started with a very small team of architects" says Anne Geenen, partner, along with Samuel Barclay, of Case Design, "but throughout the process we engaged with different collaborators, from very different backgrounds and with very different experience and expertise": the stress on the word different is crucial here to understand how the Avasara Academy was thought and transposed into reality. Drawing from the belief that collaboration and empathy lie at the core of all good work, the Academy is designed to become "a sanctuary, a safe space" for everyone to fully develop as a person. Case Design and all its collaboratos created a space that can host moments of hospitality, social interaction, reflection, play, ritual, seclusion, performance, and comfort. This is why, for instance, the artist practice is an added value to the work: the use of the colors heavily influeces our perception of a space and therefore should be valued way more - here Malene Bach, a visual artist from Copenhagen, studied natural pigments and local traditions to find the best palette for the school. As well as the collaboration with local artisans, who not only know where to get the best and most durable material for the school, but also are able to sew the school with the landscape, transforming it in a true landmark for the entire region, and to infuse it with some sort of familiarity. Everything here, from the seating space, to the colour of the stones that create the flooring is carefully chosen, to be able to meet the quality requirements (everything should be able to last for generations) and the limited budget; everything here is meant to provide the girls not only with a education, but also with a throughout experience that could really help them shape their own lives.